Name one ultramarathoner who is a household name in America. There are none. The reason is complex, but it is an indication that the sport is slowly dying. The symptoms of this death are clear. They come from a disease best called “absence”: the absence of new athletes, the absence of media coverage of events, the absence of commercial interest, the absence of celebrity heroes. Ultramarathoning simply is not growing in participation, in popularity among athletes, or in interest from the giant eyes of the media. Let me cite a personal example of this. In 1977 I entered my first ultra, the Jedediah Smith 50 mile race from Marysville to Sacramento. California. I knew little about running beyond the marathon, but I was soon to find out. The race went smoothly for 35 miles until the cumulative effect of fatigue struck unexpectedly. like a cat pouncing on my quads. My stomach was in an uproar, my legs were shot, and my mind was asking. “Why are you doing this?” Fatigue either forces you to drop out or reinforces your resolve by bringing you to a walking pace, hoping for relief and the return to running. Alternating walking and running, I made it to the finish line. I had saved the necessary resolve to run the last half mile. There are calories in pride. My watch read 7 hours and 35 minutes, my legs longed for the reprieve of sitting, my feet wanted freedom from shoes and weight. and my stomach remained unchanged. Throughout the race there were no aid stations, no course monitors, no split times, few mileage markers and fewer entrants. At the finish line stood the Race Director. He had single-handedly sponsored the ultra run no budget, no volunteers, and only a ribbon for finishing. What saved the day was my sense of accomplishment. It made the 50 mile run worthwhile. I had won the race, set a new course record, and completed a personal triumph and ordeal. Clearly absent was someone from the press, a sponsoring company, commensurate awards, and recognition for the accomplishment. The scenario today is virtually_unchanged. The reasons for running ultras have been this personal sense of accomplishment, and the challenge those have been the only incentives. Unfortunately. they are only motivational devices that will keep top athletes interested in a limited number of ultras. There needs to be much more. To their credit, ultramarathoners are the unsung heroes of running. They train longer and harder than other runners. Their races are among the most difficult athletic competitions in the world. Ultra-athletes are a rare breed, who are either living close to the bone or are high-achieving white collar workers. For the former, life is a contest: selling trophies and extra shoes when they have them. Working part-time in sporting goods stores for minimum wage and sharing apartments with friends is common. They aren’t eating right because they can’t afford to, and there is little to no coaching or sound sportsmedicine to help. Their parents and friends want to know why they don’t go out and find a decent job and why they want to race when there is no Olympic gold medal in the sport. It used to be that way in road racing, but it all changed in the late 1970s when money was passed under the table by the shoe companies, when the athletes became heroes and the sport became marketable. Times have changed for running in America, but not for the ultramarathoner. The fault does not lie with the time in history. The 1980s are a time of individual pursuit, a time of high media and commercial interest in running, a time of sports fascination and love of athletics. The fault lies squarely on the shoulders of the two principal characters: event promoters and athletes. These are the two factions that have the most to gain if the sport thrives, and yet they are the very ones forcing it into oblivion. How many runners have heard of Barney Klecker, Don Paul, Marcy Schwam, Sandra Kiddy or Stu Mittleman? They all hold world or American records in ultramarathon distances. Their names and accomplishments go unrecognized. They hold records in books with titles you wouldn’t recognize. Rather, the media eye has focused on the athletes who run the marathon or lesser distances. and has made celebrities of Joan Benoit, Allison Roe, Alberto Salazar and Craig Virgin. The result is that ultramarathoners cannot receive sponsorship from companies, cannot pay their own way into athletic competitions. and remain obscure because they have no market value. It is the responsibility of ultramarathon athletes to work collectively to build the sport. The race promoters of the sport deserve the “credit” for this condition as well. When asked who the winner of an ultramarathon is, they commonly respond that anyone who finishes is a winner. rather than giving the credit to the top finishers. Many race directors even call their races “runs,” not races. A classic example is the 1983 Western States 100. When Sacramento Magazine asked the race directors which athlete to feature in a major article on the race, they recommended Stanford Brown because he exemplified the spirit of the race by finishing in 29 hours and 59 minutes the last finisher. Last year’s champions Jim King and Bjorg Austrheim-Smith have little chance of either athletic sponsorship or due credit for their accomplishments, because they remain obscure. If the race promoters do not award them access to the voice of sports the press they will never achieve national recognition. Commercial interest in the sport of ultramarathoning has been minimal. Corporate response has been virtually nil. There has not been a prize purse since the heydays of the last century, when Charles Rowell made $25,000 in a race in 1879 (at which time an average man was working 60 to 70 hours a week for a yearly salary of $500). This race was an ultra-ultramarathon a six-day race in Madison Square Gardens in which Rowell covered 530 miles. Today, there is not a penny for performance. The reason for this lack of commercial interest is that the corporate world has found the sport as obscure as its athletes. Race promoters neither sell their event nor show its attractiveness to sponsorship interests. When a representative from Nike offered prize money to the Western States 100 Mile race in 1982, the Board of Directors refused the offer. The reason for this rejection, according to the minutes of the board meeting of Nov. 14, 1982. was that they “saw considerable danger in the pernicious influence that money will have on attracting dare-devil participants and fundamentally changing the character of the race into much more of a media event.” However, when ultramarathoners are asked if they would like to see the sport grow in the direction of prize money, media coverage and recognition. they uniformly respond that the starving athlete needs economic incentives and support. To add to this dilemma, the publications in the sport have not done well. The book Ultramarathongig by Tom Osler and Ed Dodd had a shelf life of about 2 years, with 6,000 copies printed before the publisher (World Publications) discontinued it. There was no second printing. An annual publication by Nick Marshall, his Ultradistance Summary, sold fewer than 1,000 copies in its seventh year. The only magazine on the subject, Ultrarunning, is struggling for subscribers. Circulation is currently at the 2,000 mark. There is little growth in the number of athletes entering ultras. Nick Marshall writes, “…We find that ultradistance running in the United States has slightly more than doubled in size over the past three years. That is a rapid expansion, yet it has proven to be an entirely manageable growth, since the base from which it started was so small, and some regions of the country were nearly devoid of any activity of this sort.” He reports that the total number of athletes is probably in the vicinity of 3,000 or fewer. In 1982, the number of races increased by 35.5%, but this diminished the average number of entrants per race. The average race had only 26 finishers. In the entire United States in that year there were five races which had over 250 starters. Not impressive numbers. Peter Gagarin of Ultrarunning has this to say about the flattening of the growth curve: “sometimes it looks like it is going nowhere; then there are other places. such as California, where it seems popular. Ultramarathons take something other than the distance to attract people to the races.” The exceptions are races like the American River 50 Mile which limited entries in 1983 to 550, and had over 1,000 requests. The race has become the largest ultra in the U.S., with one of the highest completion percentages (93% finished in 1983). Held in April, the springtime event attracts the interest of the media, features a beautiful course, invites the top ultramarathoners, and has developed a reputation for race management that is uncontested. The race still lacks the prize money purse (or, as TAC refers to it, developmental awards) to make it a premier event. The sun has not yet set on the sport. 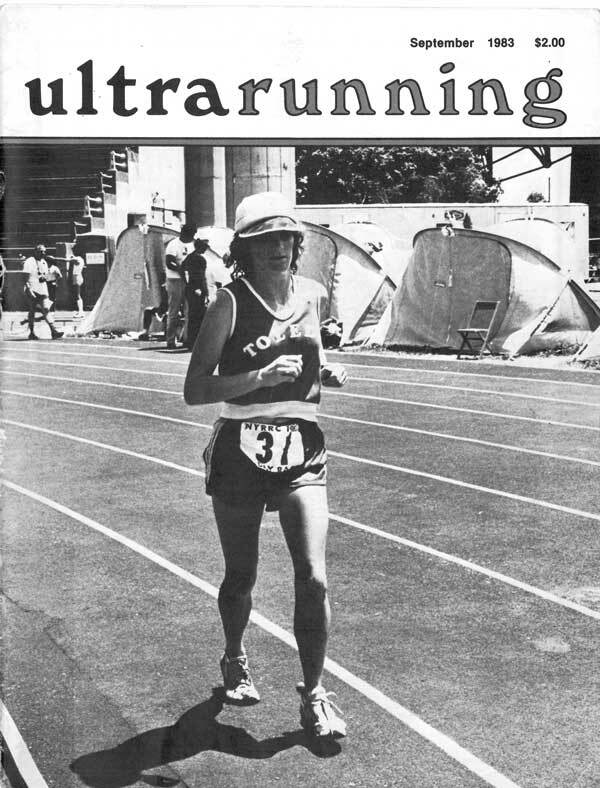 Ultramarathoning can go in two directions in the 1980s. It can continue towards oblivion and die the slow death of anonymity, or it can change. To change. the two responsible parties, race promoters and ultra athletes, need to change their perspectives. Many see the sport as plebeian they want small fields and none of the glamor that makes the sizzle in sports. There is no question that there are numerous races which will always be small in dimension; what the sport lacks is bigtime races. There are none. There are ways in which change can occur to lead ultramarathoning out of the smalltime sport field and into the area of popularity. First, the ultramarathoners need to organize. If the top athletes formed an association, they could promote the sport so that it benefits all of the athletes rather than the race promoters who sometimes organize races to advance their own organizations. This association could work to promote the sport by advocating sponsors, race promoters and the media, and by encouraging new inductees. The organization could represent itself to the networks and sell the major events to TV (Hawaii’s Ironman Triathlon reportedly sells TV rights for $55,000 per year). The proceeds could serve as a prize purse. The Ultramarathoners‘ Association could also lobby for Olympic status for their sport. There is no reason why the 50 km and 100 km distances are not recognized as Olympic events. The prerequisite to this consideration is lobbying with national governing bodies, which is one of the roles of an athletes‘ association. Developing Olympic status for the sport is an ultratask, but it would not be unreasonable or impossible if there were an organization directing its attention to gold medals. The ultra athletes are the ones who are going to have to make it happen in the sport. The National Governing Body could organize an ultramarathon circuit, with points that lead to recognition by selecting “All-Americans” for that racing year. And prize money could be provided at the end of the circuit. Ten races could be selected which would count toward series points in different regions and would be sponsored by a company that could use the series as a promotional vehicle. The possibilities are limitless. The race promoters. though, hold the trump card. It is up to them to recognize the different needs of their athletes, the middle-of-the-pack runner, the last place finisher, and the champions. They are the ones who can direct the press towards developing the ultramarathon winners into heroes whom others can both respect and emulate. The top athletes have earned that right, for they are the best endurance athletes. The promoters need to sell sponsorship in their events to raise the revenue required to provide professionally orchestrated races. Finally, they need to invite the participation of the press of the world. That is simple: mailing press releases, hiring public relations firms, or getting them to volunteer, negotiating TV rights, encouraging magazine articles, and in several other ways developing the visibility of the sport and the athlete. There simply is no one in the marketplace currently working towards this. There is a cure for the death of ultramarathoning and the cure is not an easy pill to swallow. There will always be the few participants who will challenge the barriers of human performance for no greater” reward than meeting the challenge. Yet, the satisfaction gained from the challenge simply does not pay the rent or buy groceries. Neither does it promote the sport. Ultramarathoning needs to grow and one of the best ways is by providing athletes with incentives, race promoters with adequate budgets, the media with invitations. and sponsors with visibility. Ultramarathoning must grow out of its image of being someplace between crazy and dangerous. It needs to grow so that athletes are regarded as the superior champions. the races are seen as class events, and the race directors are involved in media and sponsorship support. Combined, these forces can foster the longterm growth of the sport of ultramarathoning. There is a cure. As an ultrarunner, I have to completely disagree with you. The sport isn’t dying, it’s increasing in popularity. All you have to do is look at the older ultra races as they fill faster each year, and then have to go to lottery systems. And then, you have to run a qualifying ultra just to get into another race’s lottery. I’ve only been running ultras for 5 years, but already I can see how much the sport is growing. There are more sponsored runners, more prize purses, more clothing/shoe/food companies specializing in endurance runners. I’m just utterly amazed that you think ultrarunning is dying. Perhaps it’s the area of the country you live in. HI Lisa, Just in case you missed it, this was originally published in 1983 (see at the top). I’d like to see a recap article. Where are we now? Where are we headed? You realize this is a reprint of a 1983 article, right? Nope, I missed that entirely. It’s been a long day. Sorry, I missed the date at the top.